this year I wanted to go bigger and better than last year's rainbow cake. it will never be possible. I outdid myself last year and every birthday cake I present andrew with from here to the end of time will never be as awesome as my rainbow masterpiece. this year I decided to do something different so I made cake pops. contrary to my usual "it was a breeze to make, so easy!" these were not. these were challenging and if these cake pops had feelings, the choice words I said to them would have had them locking themselves in their bedrooms crying for days. thankfully it was just funfetti cake and it doesn't have feelings. I followed the instructions I read all over the internet. bake a cake (from a box or from scratch, kudos to you if you'd actually bake one from scratch for these things!) and let it cool. crumble the cake in a bowl and mix in a can of icing. form into balls and cool. melt chocolate and dip them in it. 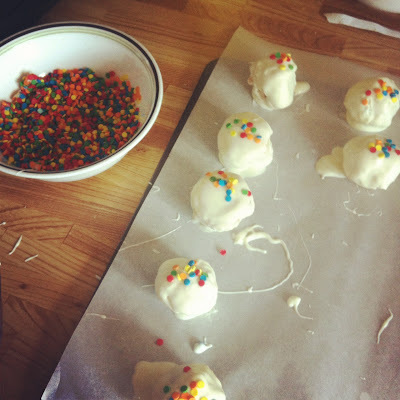 after rolling them into balls I decided I was going to put them in my freezer. little did I know that the container I had them in was just a snick too big and the freezer door wouldn't seal. in my fit of frustration I grabbed the duct tape and taped the freezer closed. a few hours later I melted my vanilla chocolate wafes and tried to coat the cake pops. it was a disaster. would I make them again? absolutely. would I be better prepared? of course. I think next time I'd be a little more adventurous with them because trying to precisely make them look like something may make me less impatient than when I'm rolling them around in chocolate. either way, I think the birthday boy enjoyed them and to me, that is all that matters!